Wildlife…Magnificent Views…Temperate Climate…Excellent Conditioning…All Right Next to Rossland—One of the Top Adventure Towns in North America. Plus 30-40 Yards Extra With Your Driver. 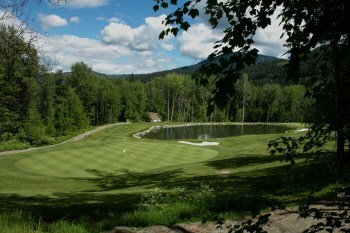 Golf in the West Kootenay is a big part of what makes golf in Canada special. Mountain golf combines superb scenery, interesting layouts, elevation changes, and the fun of watching a drive that normally travels around 230 yards go about 260. If you’re looking for the perfect example of a modern classically-designed mountain golf course, you’ll find it here at Redstone. In the spring, you can play golf in the afternoon while enjoying the backdrop of snow-capped peaks. In the summer, enjoy the long days and warm days. In the fall, the trees that flank the fairways turn into a visual feast that will make you want to squeeze in an extra 18 holes. Some mountain golf courses offer wonderful views and scenery but not much else. 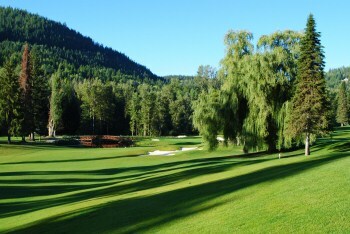 To make sure that the quality of the golf matched or even exceeded the quality of the environment, we hired Les Furber and asked him to design his first ever “Les Furber Signature Course.” Furber, a Canadian, and a former Robert Trent Jones Associate, has designed, built, or renovated over 70 golf courses including Banff Springs. His work here at Redstone combines the strategic and the heroic for a golf course that will seriously test the better player from the back tees while remaining playable from the forward tees. There are three par-3s on the front nine, the 3rd, 5th, and 7th. All play downhill to generous greens and there were 28 holes-in-one during the golf course’s first season—so you can score here at Redstone. The most interesting of the par-3s on the front is the 238-yard 5th which requires a bold strike off the tee—even a good player will be happy with a par. The 8th is an excellent risk-reward par-5 at 538 yards from the blue tee and 502 from the white tees; big hitters, especially at altitude, will be tempted to go for the green in two but a pond flanks the putting surface. The back nine begins with a difficult par-4, 456 yards from the back tees. It’s the number one handicap hole on the golf course and demands a difficult drive over a ravine. There’s not much of a let-up on the next, a gargantuan par-5 that’s 627 yards from the tips. It’s the most scenic hole on the golf course but a tough par and it’s the #2 handicap. Yes—there are challenging and difficult holes at Redstone but there are birdie holes too, holes that reward solid shots with scoring opportunities. Throughout the course, there are elevation changes, deep bunkers, chutes, woods, streams, ravines, and other hazards to navigate. Give these a wide berth and a good score is possible. However, big numbers await for those who try to bite off more than they can chew or venture into the woods or streams. The run to the historic clubhouse ends with a tempting par-4, the 319 yard 16th. Most will be tempted to drive the green and try for a birdie or even eagle but if the gambit fails, a double-bogey or worse awaits; most golfers score well on this hole by laying up. The par-3 17th is all over water and looks relatively benign at 151 yards but, take the advice of the members and take an extra club, even at the altitude. Par on the 18th is difficult: it’s a 460 yard par-4 and you’ll deserve a beer at the bar if you card a four. The greens at Redstone are mostly large and are not overly contoured. However, due to the mountain aspect, it’s vital to take a look at each putt from both sides. Open with all 18 holes in 2008, grow-in at Redstone has been excellent and it’s already one of the best conditioned courses in the area. The course has A4 bentgrass on the greens and bluegrass fairways and tees. It’s also the only course in the area with white silica sand in the bunkers—making the course even more visually appealing. Redstone has a temperate climate with relatively dry summers; it’s warm enough for golf eight month out of the year. You can enjoy golf at Redstone three ways. 3. Become a member with no initiation fee and sensible annual dues. As good as the golf is at Redstone, it’s just one part of the equation when it comes to enjoying the scenery and environment. Whether you live here or visit, take advantage of the skiing, fishing, hiking, mountain biking, and more. And in the evening, take advantage of the nightlife and dining in Rossland. Redstone’s elevation is approximately 3,500 feet. This adds at least an extra 20 yards to a drive and 10-15 yards to iron shots—so enjoy the extra distance and club accordingly, except on the 17th, where you will always need an extra club.